Daily deals have always had a social aspect about them. Sometimes termed social buying or social shopping, those participating in daily deals often share their bargain news with others on social networking websites like Twitter, Facebook, and Google+. In addition, many daily deal websites now allow users to comment publicly about deals from their website, giving shoppers a new way to communicate with other shoppers. 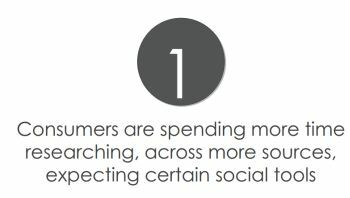 A 2011 study by The E-Tailing Group detailed social shopping trends and reported that consumers are spending more time researching across more sources, and expecting certain social tools. And that hasn’t changed. If anything, daily deal shopping became even more social this week with two important announcements. DealTicker, Canadian daily deal site, joined hands this week with Pintrest, the hottest digital pinboard on the Internet these days. DealTicker says that users can now pin images of DealTicker offers to their pinboards and share them on their social networks. According to TechCrunch, Pinterest has more than 10.4 million registered users, 9 million of which are Facebook-connected. The move by DealTicker to broaden their users' reach and ability to communicate is smart and well planned and, if you believe analysts, is something we'll likely see other daily deal sites doing in future months. In a first-of-its-kind move, American Express teamed with Twitter and daily deal websites this week to reward cardholders and make applying deals to their daily lives even easier. With the new program, American Express cardholders will be able to sync their credit card with their Twitter account and then tweet Groupon and LivingSocial deals using specialized hashtags. Those deals will then automatically be added to their American Express card. Daily deals are no longer simply maturing, it seems, but also making strategic moves that will help their user base connect and make even smarter buys. John Docker, Miami daily dealer shopper, is pleased. “The easier it is to buy and share deals, the more the deals interest me,” said Docker. It was dark when I woke. This is a ray of sunihsne.